1.2 km walk from train station Novella and 25 min.walk to center. Breakfast enough normal. Clean, but old property. Nice hotel. It is located about 10 minutes walk from the railway station. The area is very quiet. Room is quite comfortable. Good towels and bed-sheets. Calm neighborhood. Clean room. There was an adequate variety of breakfast items available. 5 minute walk to cruise shuttle bus , clean and you get what you pay for. Short walk to waterfront and restaurants. It was clean and everything went smooth. The evening staff was a bit grumpy but the morning guy was very cheerful and a lot of help. I am not a lover of continental breakfast, but the selection of fare was good at the hotel. iH Hotels Firenze Select This rating is a reflection of how the property compares to the industry standard when it comes to price, facilities and services available. It's based on a self-evaluation by the property. Use this rating to help choose your stay! 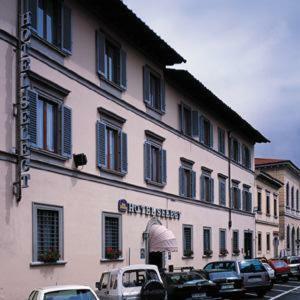 Located in a residential area of Florence, the iH Hotels Firenze Select is set in a 19th-century villa. It offers friendly, personal service and elegantly decorated rooms with tea/coffee makers. Rooms at the Select are equipped with a mini-bar, satellite TV and private bathroom. Some have Florentine-style décor, others feature a modern design. A generous buffet breakfast is provided at the Select Hotel’s. Guests can enjoy cappuccino and fruit juice, together with Tuscan cheese, pastries and fresh fruit. The Hotel Select staff are available 24 hours a day. The tour desk organizes trips to the Uffizi Gallery or Florence Cathedral, both a 15-minute bus ride from the hotel. 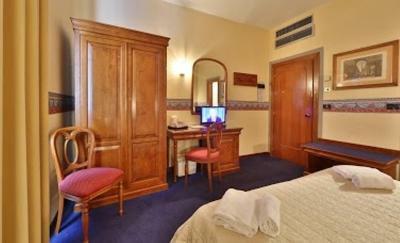 When would you like to stay at iH Hotels Firenze Select? Air-conditioned room with free WiFi, carpeted floors and an LCD TV with satellite channels. Air-conditioned room with free WiFi, a mini-bar and an LCD TV with satellite channels. Air-conditioned room with a mini-bar, free WiFi and an LCD TV with satellite channels. This single room features air conditioning, free WiFi and mini-bar. It also has a satellite LCD TV. This room has air conditioning, a satellite LCD TV with international channels. WiFi and a mini-bar with soft drinks are available. Guests adding a parking space to their booking receive a discount. This quadruple room has air conditioning, a satellite LCD TV with international channels. WiFi and a mini-bar with soft drinks are available. House Rules iH Hotels Firenze Select takes special requests – add in the next step! ATM card iH Hotels Firenze Select accepts these cards and reserves the right to temporarily hold an amount prior to arrival. iH Hotels Firenze Select accepts these cards and reserves the right to temporarily hold an amount prior to arrival. The second day of our stay the breakfast was not complete. There was no juice and coffee. No fridge. Poor soundproof. The room is not small but the beds and other furniture arranged doubtfully - you always risking to bump against the edge of something when you are inside. The room was ready only at 2 P.M. on January 1 - of course they did not inform anybody beforehand so there were a lot of unhappy customers at the lobby that day. Very far from city center by foot. Following the first night of our stay my family and I all woke up with bed bug bites. Although the staff moved us to another room for the second night of our stay they did not make any effort to compensate us for our big inconvenience. No harbor views like your lead to believe. Clean room. Breakfast simple. Private parking for 15€/day which is a great deal! Location is good, you can walk into the main attractions within 10-15 minutes through nice streets with lots of restaurants. Nice hotel, in a good location. The bed was not really comfortable.